What might the cities of the future be like? This issue links to three articles with different sets of possibilities, followed by a discussion of the interesting uses for English words related to vision and imagination. These future visions are suitably romantic and optimistic (after all, it IS Valentine’s Day), and they are definitely visionary— a long way beyond our current urban experience. I liked the variety of ideas, and the hopefulness. Some of these cities float, and others are built overhead, but all aim for livability and sustainability. I would love to hear which you (or your students, if you use any of these in a class) like best, or think are most realistic or attainable. A vision of New York in 2050 is the least abstract of the articles. It starts with recent changes that make New York City a little “greener” (and more pleasant for the people who live there), and then proposes other changes to be made over time. The second article is a summary of a much longer (linked) report, again emphasizing solutions to major urban problems like the need for less carbon emissions, more food grown on less land, better traffic control, and eventually finding more space for cities on or under the sea. Ziptopia is the most futuristic—a set of nine future city designs or concepts with very imaginative illustrations. The final project concept they show has actually already been built. The words I want to look at today are not difficult or uncommon, but they illustrate the ‘flexibility’ of English words in two ways. They can be used literally OR metaphorically, and they transition easily (and sometimes without even changing form) from one part of speech to another. ‘Vision’ refers to seeing, but it can mean eyesight, insight (depth of understanding, either about the present or looking into the unknown future), or even a revelation from God. To ‘envision’ (a verb) is to imagine or picture the future. (Note that ‘picture’ is used as a verb here, as well.) Visionary can be an adjective, or a noun referring to someone with a vision beyond what others see or can imagine. An image is a likeness, copy, picture (especially in a mirror or camera) or even a statue. To imagine is to picture something mentally (“in the mind’s eye”.) 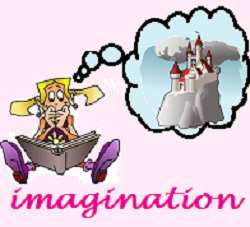 Imagination is that mental ability to picture something that’s not present. Imaginary is an adjective meaning unreal—only existing in the imagination.